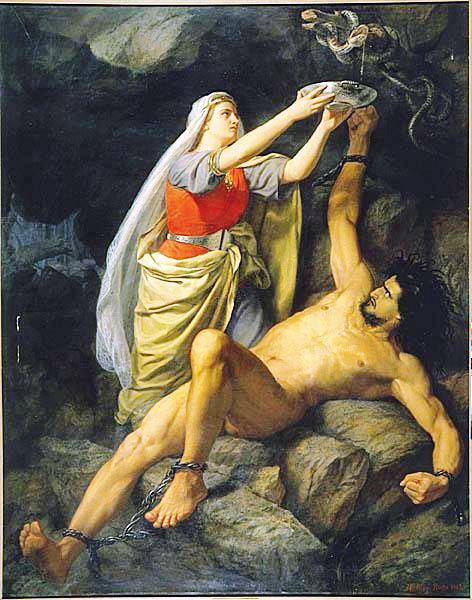 “Loki and Sigyn” by Mårten Eskil Winge. Many moons ago, I fell asleep thinking of Loki. It was a Wednesday night. On the edge of dream, I was drawn into the astral. There, in a dank cave – sometime between ages ago and just the other day – I met Sigyn, one of Loki’s wives. The Lady stood worn, on the edge of her hope. Loki was there, bound to a large boulder. Surprisingly, he slept for most of the time that I was with them. He is sometimes able to sleep just after Sigyn has emptied the bowl. Timidly, I approached Sigyn and the smaller of the two burdens of her arms. I offered to hold the bowl as an offering to her. I could feel the noxious poison accessing my pores and threatening my life even through the bowl. I warded immediately and also projected Elhaz onto the vessel in an attempt to block its corrosive effect on me. Then I attempted to craft a bindrune, both Elhaz and Thurisaz. That one caused the sleeping Loki to stir and the hanging serpent to hiss. Got it. That rune is off limits in this place. Very soon after that Sigyn gestured for the bowl and she sent me to obtain a glass of water for her from the stream that runs near her hall, which was some ways away. The waters there are incredibly pure and healing. I drank deeply and felt better instantly upon drinking. I brought a cup of that water back and offered it to Sigyn. She drank her fill and thanked me. A strong scent of licorice filled the cave when I asked what offerings she might like. This entry was posted in Deity Information, Divine Encounters, Runes, Spirit Work and tagged Dreams, Elhaz, God Loki, Goddess Sigyn, Licorice, Offerings, Thurisaz by Wandering Woman. Bookmark the permalink. Wonderful insight, thank you for sharing.